In their second ever NCAA Tournament appearance, the No. 13 seed Wright State Raiders fell at the No. 4 seed Texas A&M Aggies 84-61 in College Station, Texas. The Aggies were aided by a big first quarter against the Raiders and by hot shooting from behind the arc. 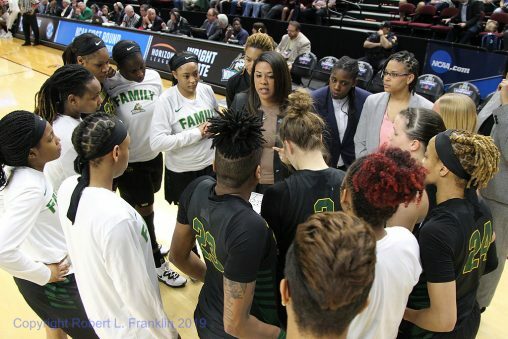 The Raiders end their season with 27 wins, the most ever by a Wright State women’s basketball team. Wright State qualified for the tournament by winning the Horizon League tournament title. Aggie Chennedy Carter led all players in the game with 27 points. The Raiders’ Angel Baker put on an equally impressive performance with 22 points, three assists and two steals. Michal Miller scored 12 points, all in the second half. Mackenzie Taylor added 10 points and pulled in six rebounds. Symone Simmons led all players with 13 rebounds and added seven points from the field. The quarter started with Carter converting one shot from the line for the Aggies. A jumper from Baker then a driving layup from Mackenzie Taylor made the score 17-32 with 7:28 on the clock. Three unsuccessful shots coming off of offensive rebounds prevented the Raiders from matching the Aggies scoring in the quarter. After collecting an offensive rebound, Simmons made the score 21-36. Before the media timeout, the Aggies got one more score from N’dea Jones. Baker put on a handles performance after finding Teneshia Dixon with a no-look behind the back pass in the lane. After collecting the ball in the lane, Dixon ended the impressive play with two points to make the score 23-38. One possession later, Dixon added two points from the foul line. With just over a minute remaining the half, Tyler Frierson drew a foul and add one point from the line. 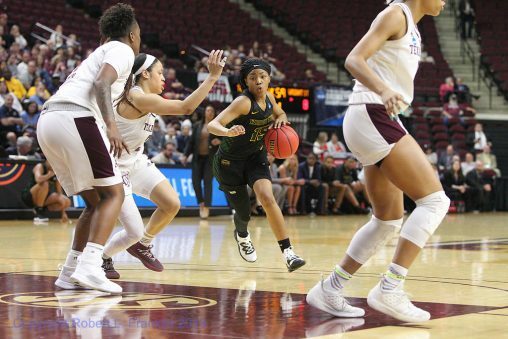 A&M’s Kayla Wells hit a three-pointer but Wright State’s Taylor answered with a three of her own to make the score 29-42. The first minutes would be all Aggies as they outscored the Raiders 8-2 after halftime. Miller scored her first points of the game with a layup and then added two more on the next possession to cut the Aggies’ lead to 15. Simmons came up with a powerful block against A&M’s Carter while she drove to the basket. Taylor hit her second three of the game to make the score 38-52 with 5:46 on the clock. Baker put in a three on the next possession to pull the Raiders back within 13. The Aggies then went on a 9-0 run to build their lead back to 20 points. Baker ended the Raiders’ dry spell with another three-pointer. After an Aggies foul shot, Baker added two more points off of a jumper. The quarter ended 46-67 in favor of the Aggies. Miller opened up scoring for the Raiders with a jumper and then one point from the line. The Aggies set their season record for three-pointers two possessions later. Looking at the 25-point deficit, Baker hit a three-pointer after receiving the ball from Simmons. Before the media timeout, Baker put in a layup with 6:01 on the clock. With 4:21 remaining, Miller forced a steal then finished the play with two points for the Raiders. One possession later Baker put in two points to make the score 58-80. After two points from the Aggies, Miller hit a three for the Raiders. With under two minutes in the game, A&M added two points from a layup to finish the game up 84-61.